Yoga, hockey, football, basketball and other sport clothing often retain odor from workouts and this stale sweat odor can easily be noticed by others. Save yourself the embarrassment of sweaty body odor and other bad smells. 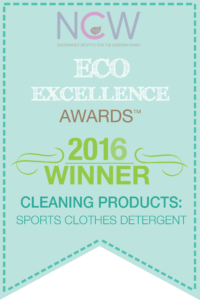 Smelly Towel Cleaner was created as a solution for this problem and works so well it was voted the best sport clothes cleaner by NCW EcoAwards for 2016. The all natural formula is perfect for removing any odor from any clothing and maintaining your washer freshness while using the machine.